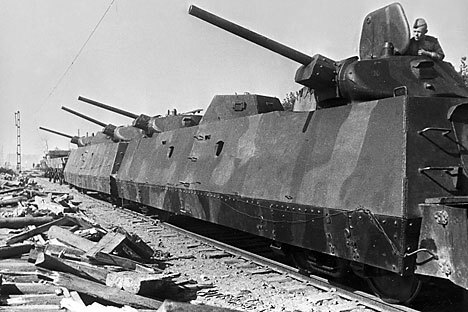 Armored military trains proved their worth during the war and were instrumental in the Bolsheviks winning. The USSR later took the lead in the development of the armored train, which still remains in service with the Russian Army. When a war has no exact fronts and scattered forces fight over a wide area, never knowing where the enemy will appear next, it is superior mobility that determines the victor. The mobility of large armies used to depend on control of the railways to move reinforcements, ammunition and food. And with their armor, artillery and machine-guns, speed and combat readiness, the bronepoezd, or military train, was a powerful resource in Russia. Early versions appeared shortly after the first steam railways were built, and the forerunner is believed to have been launched in France in 1826. Equipping trains with cannons and machine-guns was further developed by Colonel Ivan Turchaninov, a Russian Army officer who emigrated to the U.S. and served in the Union Army in the Civil War. During the siege of Pittsburgh in 1864, John Turchin, as he became known, armed trains with 13-inch mortars that could fire 100 kg shells to a range of 4.5 km. French engineers first fitted trains with armor in 1884 and the rapid technical advancements of the time quickly overcame the project’s many initial flaws. In the Boer Wars of 1899-1902 the British also actively used armored trains to secure their lines of communications from the Boers’ guerrilla tactics. By the outbreak of World War I most European armies had a handful of rudimentary armored trains. When Russia withdrew from the war it had seven in service. The Civil War brought a boom in military rail power. Some armored trains used by the Workers' and Peasants' Red Army came from Imperial Army stockyards, others were mass-produced. Most were, however, built from parts taken from ordinary passenger carriages. By the war’s end, the Red Army had 122 fully armored trains, with improvised variants bringing the total to 400. Like other complex equipment inherited from the Tsarist army, armored trains were initially deployed without much tactical thought, being simply thrown into the thick of battle. But as the Bolsheviks gained fighting experience they learned how best to use these mighty “land cruisers”. During the defense of Tsaritsyn (modern-day Volgograd) in 1918 armored trains were deployed en masse for the first time ever, with 15 of them racing around several local railway lines to great effect. The USSR kept the idea alive until World War II demanded the construction of new designs, including railroad air defense batteries, with accompanying changes in tactics. With advances in artillery, aviation and tank technology, the trains’ advantage of mobility was partially lost: Similarly armed with cannons and machine-guns, tanks could attack at speed and without rails. Armored trains were now also used to defend strategic objects in the rear. During the war the Soviets ran some 200 armored trains, including the highly successful OB-3. Serving mainly as an anti-artillery weapon, it could launch rapid strikes against predetermined targets, silence gun batteries with a deluge of fire and quickly withdraw to safe positions before the enemy could hit back. Up to 1953, armored trains secured rail routes and infrastructure in Western Ukraine from attack by Ukrainian partisans. In 1958 railway artillery development was halted and by the end of the decade the trains had vanished altogether. Soviet military commanders and engineers were later obliged to resurrect the idea as relations with China deteriorated and they were faced with the impossibility of protecting the vast and sparsely populated border lands in Eastern Siberia, where there was no developed road network. Existing roads could handle only four or five motorized rifle divisions a day, while a division with heavy equipment could be moved quickly with 20 trains on the Trans-Siberian railway. New designs incorporated standard and mass-produced components like turrets from T-55 tanks or from Shilka mobile anti-aircraft batteries. Primary railway fighting detachments consisted of pairs of 55-ton open platforms carrying T-62 tanks. These were supported by BTR-40 armored personnel carriers with folding frames with spring shock absorbers that enabled them to operate from platforms, and with steel wheels that allowed them to drive on roads and rails alike. Four such tank trains were kept in storage at substations 40 kilometers from the city of Chita until the early 1990s. Armored trains last saw action in Chechnya, where they protected railway repair crews and normal trains from insurgent attack. Baikal and Amur class trains had firing ports for machine-guns and AGS-17 grenade launchers as well as platforms with BMP-2 infantry combat vehicles. They were also accompanied by the same modified BTR-40 personnel carriers for reconnaissance and communications purposes. Russian railway forces have now discontinued acquisitions of train armaments. All Baikal and Amur trains in service in the Southern Military District will finally be decommissioned in 2015, bringing this era to an end. Or will it? Wide experience in construction and use of these trains helped improve the Soviet nuclear triad in the 1980s with the introduction of train-borne RS-22 (“scalpel”) missiles. The systems were scrapped after the collapse of the USSR - but Russia’s military and political leadership has now decided to review the project. Perhaps the armored train has not yet run out of steam.